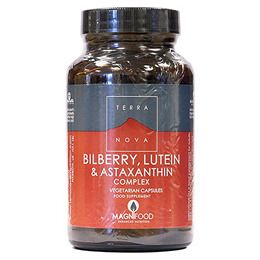 TERRANOVA Bilberry, Lutein & Astaxanthin Complex is a scientifically-based formulation of nutrients for eye support enhanced with highly active, whole and unadulterated superfoods and botanicals. Anthocyanins, the deep blue pigments abundant in bilberries, have been the subject of a great deal of research, especially with respect to their potential applications in maintenance of healthy eyes, circulation and connective tissue. Bilberry anthocyanins also possess powerful antioxidant properties. Bilberries have the second highest content of naturally-occurring anthocyanins of any plant currently tested (second only to aronia berries). The average content in dried bilberries has been reported to be approximately 2.9%, compared to 4.3% in the freeze dried bilberries used by TERRANOVA. Kale is a potent natural source of eye supportive nutrients such as the antioxidant carotenoids lutein and zeaxanthin and sulphur. Acai is one of the highest ORAC (oxygen radical absorbance capacity) value fruits with significant levels of vitamin E and anthocyanin flavonoids. In fact, a 2006 study reported that acai had the highest ORAC value against superoxide radicals of any plant previously tested. Superoxide radicals have a detrimental effect on eye health. SRB contains more than 100 known antioxidants, many which are important to the maintenance of eye health. Numerous carotenoids, tocotrienols, tocopherols, alpha lipoic acid (which also recycles antioxidants such as vitamins C and E), coenzyme Q10 and the enzymes superoxide dismutase (SOD), peroxidase and catalase are among the most significant. Blueberry Fruit, Kale, Acai Berry, Watercress, Stabilized Rice Bran, Lutein, Vitamin E, Vitamin C, Taurine, N-acetylcysteine (NAC), Zinc (as ascorbate), Natural Beta Carotene/Mixed Carotenoids, Astaxanthin, Grape Seed Extract, Manganese (as bisglycinate), Selenium (as selenomethionine), Copper (as gluconate), Vitamin A (as palmitate prep), Alpha Lipoic Acid, Vegetarian Capsule Shell (hydroxypropyl methylcellulose). As a food supplement for adults, take 1 or 2 vegicaps daily with food. Do not exceed stated dose unless directed by a healthcare practitioner. 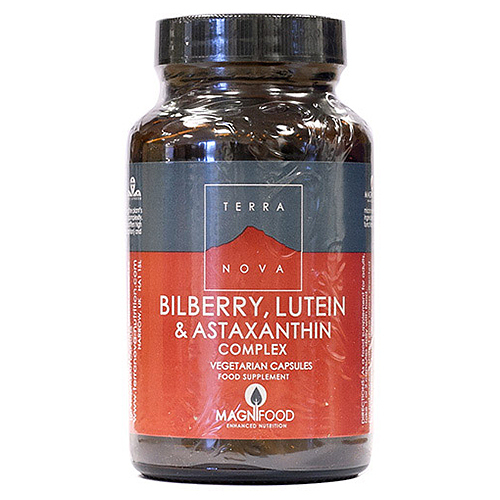 Below are reviews of TERRANOVA Bilberry, Lutein & Astaxanthin - 50 Vegicaps by bodykind customers. If you have tried this product we'd love to hear what you think so please leave a review.